Social “signals” increasingly influence search results in both Google and Bing. The search engines are coming to consider social signals as more indicative of how searchers value a page than traditional link signals — though links remain very important to search engine optimization. 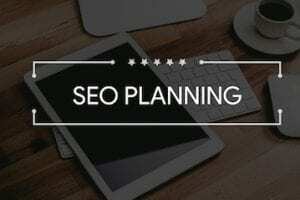 In addition, the engines consider social signals harder to falsely manipulate than the content and link signals that have traditionally driven SEO. I recently wrote about this growing trend in “Managing SEO and Social Media Together.” Ecommerce merchants can increase social interaction with a site simply by including the right social buttons or widgets on the right pages of the site. Bing and Facebook have an agreement to include Facebook social data into Bing’s search results, both as actual results and as a way to influence rankings of other pages that Facebook users “Like” or link to. Google doesn’t have access to Facebook data as directly as Bing does, but signs point to Google’s ability to crawl public portions of Facebook to cull some social signals. In addition, Google has its own social network in Google+, enabling Google to harvest all sorts of juicy user data about which sites and pages users like and link to. Both search engines have the ability to crawl Twitter for social signals as well. Social signals are clearly important to search engine optimization, but many ecommerce sites struggle with how to encourage more customers to behave more socially with their brands. For starters, make it easy for consumers to be social when they’re on your ecommerce site. Say a consumer is looking for a pair of wool socks that are warm when wet, not itchy and are comfortable enough to hike in all day or lounge around the house in. Wool socks are not that interesting, but to the right person the search for the right pair of wool socks is captivating. That person — and millions of others bent on their own pursuit of things interesting to them — will very likely Tweet, Like, +1 or blog about that product when he finds it. If the product page contains social buttons for Twitter, Facebook or Google+, that consumer is far more likely in his exuberance at having found the perfect pair of wool socks to Tweet, Like or +1 that product page on the spot. Conversely, if the product page does not contain those buttons, behaving socially may not even occur to that consumer. Or it may cross his mind and the thought of copying the URL, going to Facebook, pasting the URL, and thinking of something to say is just beyond the effort he’s willing to make. Including social buttons in the right pages and at the right stages of the conversion funnel is key to increasing consumers’ social behavior. The payoff of that social behavior is that the consumers’ friends who also search for wool socks are very likely to see that same product page in their search results. Of course, those same friends are also very likely to see the Tweet, Like or +1 and click straight through to the product page to shop on their own as well. 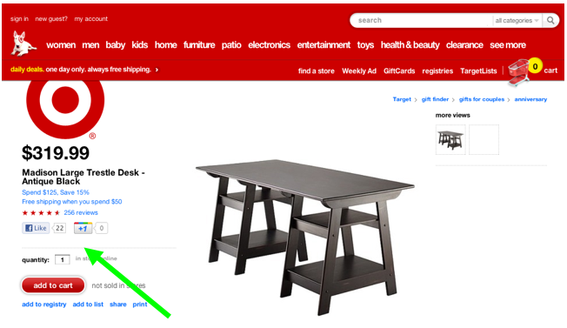 Target.com provides the Facebook "Like" and the Google+ buttons on its product pages. Which Social Buttons and Where? The big three buttons are Twitter, Facebook and Google+. Choosing which buttons to include comes down to a few key factors. Find your customers. Which social media sites do the site’s target audience use most? If you’re not sure, check some recent studies like KISSmetrics’ findings on social media site usage by gender, income, and other relevant demographics. Consumer or business? Is the product or service targeted toward a consumer or business audience? Business-to-business sites may want to focus on Twitter and LinkedIn sharing. Communicate with the marketing department. Which social media sites does the marketing team focus on? If marketing is working hard to drive transactions from the Facebook channel, it will be important to include Facebook sharing buttons on the site. Space considerations. How much space can be carved out of the existing page templates? Is there room for one button, three buttons, or one widget? Work with design and user-experience teams to balance the social and search benefit with the user and brand experience. 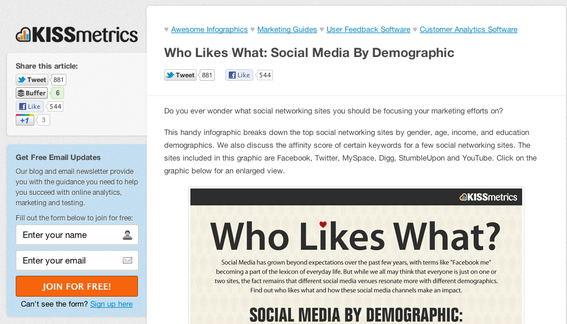 KISSmetrics can help merchants identify which social media sites their prospects use. After choosing the social sites to support, choose which types of icons, links, buttons and widgets are most appropriate on each different page type. For example, many sites include in their headers or footers a set of icons that link to their Facebook or Twitter profiles along with their email newsletters and RSS feeds. Icon links like these enable customers to interact with a brand over time, but do not encourage point-of-excitement sharing such as the wool socks customer would engage in. Linking icons are important for their own reasons, but they’re simply not functional enough to encourage the sharing of individual pages. Each social media site offers a variety of sharing buttons and widgets to encourage visitors to sites all across the web to share content. These buttons and widgets are free from the sites themselves and come in a variety of sizes, shapes and functionalities. 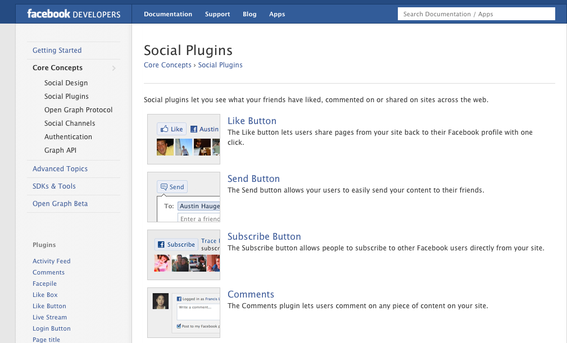 Facebook alone offers 11 social buttons and widgets from the basic Like button to Facepile, which “displays the Facebook profile pictures of users who have liked your page or have signed up for your site.” The other major social sites’ button and plugin offerings can be found at Twitter, Google+ and LinkedIn. For example, if an ecommerce site chooses to enable stronger sharing for Facebook across its site, it may use the following buttons, depending on the type of page. Header or footer on every page. Insert icon links to the Facebook profiles for the site. The goal is to enable longer-term communication with customers via the site’s Facebook profile. Category pages. Place the Facepile widget in the side navigational channel to show customers which of their friends Like the site as a whole. The goal is to inspire confidence in the site based on the number of people overall — or friends specifically — that also trust and like the site enough to Like it on Facebook. Product pages. Place the Like button near the product image or name. The goal is to capture point-of-excitement Likes regardless of whether that person eventually buys the product or not. Shopping cart order confirmation page. Place the Like button near the images or names of the products purchased. The goal is to capture Likes from people who are proud of their purchase and want to show it off. Each product needs its own Like button, however, because the goal is to increase Likes for the product pages for purchased products, not to Like the confirmation page itself. Blog and marketing pages. Insert the Like button under the main headline or near the primary visual. The goal is to enable customers to spread the word about initiatives and charitable programs to increase positive buzz about the brand naturally. The Facepile widget could also be beneficial on these pages to engender trust. Email newsletter. When products or initiatives are featured, include a Like button at the end near the “Read More” link that the customer would click to visit the product or initiative page. The goal is to capture Likes from customers who have read enough in the newsletter to know they Like the product or initiative but have no intention of clicking through to the site to transact or read more. This article has been a single example of using two plugins for one site. Major etailers like Amazon use all of these tactics and more to capitalize on the value of social buttons and widgets to their organic search and other marketing channels. The easier and more pervasive the social buttons are across the site, the more likely customers are to engage socially, but it doesn’t have to be an all or nothing proposition. Consider dipping a toe in the social plugin waters with a single page type and a single social network to get the feel for how the buttons interact with the platform and how consumers interact with the buttons.